Christine Parker, an honors graduate student in the museum studies program, fell in love with an undergraduate curator’s course she took in fall 2012. She thought to herself, “I could do that.” Now Parker, who will complete her master’s degree in spring 2016, is working under Nancy Weekly, head of collections at the Burchfield Penney Art Center and instructor in the museum studies program, to co-curate a groundbreaking and historically important exhibit. Through These Gates: Buffalo’s First African-American Architect, John E. Brent, opens Friday, October 9, and runs through Sunday, March 27, 2016, at the Burchfield Penney. The exhibition will explore Brent’s significant contributions to architectural and landscape designs in the Buffalo-Niagara region and his influence as a community mentor and role model for other black architects. The son of Calvin Thomas Brent, the first black architect in Washington, D.C., Brent carved out a career that leaves an important legacy for Western New York. Parker began researching Brent in the last semester of her undergraduate studies with the late Felix Armfield, assistant professor of history and social studies education. She continued her research with Weekly and decided to make Brent the focus of her master’s project. After collecting data from archivists, academics, librarians, and civic employees nationwide, Parker and Weekly created a compelling story that will include vintage and contemporary documentary photographs, original drawings, blueprints, true-scale copies, and artifacts. The late Edward (E.O.) Smith Jr., a SUNY Distinguished Professor and chair of the History and Social Studies Education Department who founded the museum studies program, always saw the potential for a Brent exhibition, Weekly said. “With this exhibition, we want to reflect on the life of Brent but also show the legacy he created, one that influenced other architects,” Weekly said. “We want to show how he was able to build a career during a time of segregation. He had incredible fortitude. Brent arrived in Buffalo in 1912 and began working with Max G. Beirel; he later worked for several architectural firms. In 1926, he opened a home office in Hamlin Park and managed many private commissions. His most notable work, as the exhibition title implies, are the cast iron gates that serve as the formal entrance to the Buffalo Zoo. He also designed and implemented more than 16 facilities and exhibits at the Buffalo Zoological Gardens while he was employed by the city’s Parks Department. Other Western New York structures he was commissioned to build included the Mitchell Miles Residence in Cheektowaga, the Michigan Avenue YMCA in Buffalo, and the Wales Hollow Camp for the YMCA in Wales, making him only the second African American architect in the country commissioned to design a YMCA. Additionally, Brent became the first president of the Buffalo branch of the National Association for the Advancement of Colored People (NAACP) in 1914. The exhibition is dedicated in memoriam to Armfield and Smith. 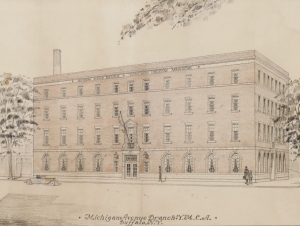 Pictured: John Edmonston Brent (1889-1962), Michigan Avenue Branch Y.M.C.A., Buffalo, N.Y., 11-1-1926; graphite and transparent watercolor wash on paper, 12 7/8 x 22 /16 inches; Lent by descendants of John E. Brent.